Throughout this series we’ve focused mostly on PFF’s Signature Stats and how they relate to fantasy football and what they mean for the 2018 fantasy season. This week and last, we shifted our focus to PFF’s grades. Today, we’ll discuss wide receivers. To access our 2017 season-long grades (if you’re an Edge or Elite subscriber) you can go here. If you’d like to read more about our grading process, click here. If you’d like to hear a few personal anecdotes as to how our grades helped me spot a few breakout candidates before the rest of the fantasy world, I’ll refer you back to the intro article here, where I discuss quarterbacks. I have also discussed running backs. Here are the five wide receiver grades I found to be most surprising. Since January 2015, Gordon has only played in five NFL games. Are you worried he might still be a little rusty after so much time off the field? I wouldn’t be. Gordon joined the team midseason last year and was still highly effective. He didn’t play enough snaps to qualify but would have graded out 17th-best at the position in PFF receiving grade. Gordon is still just 27, and in his last full season (2013, at the age of 22), he averaged 22.4 fantasy points per game. For perspective, 22.4 fantasy points per game still ranks top-20 among all wide receivers all-time. This was despite Cleveland averaging just a 75.1 team passer rating, which ranked seventh-worst that season. There’s more competition for targets in Cleveland now (after signing Jarvis Landry), but that should be somewhat offset by the quarterback upgrade (to either Tyrod Taylor or Baker Mayfield). Last season Jackson ranked a lowly 62nd in yards per target (7.4) in his first year in Tampa Bay. Over the prior four seasons, Jackson averaged a league-leading 10.9 yards per target. He also fell from 13.7 fantasy points per game to 9.9. What went wrong? Perhaps it’s just that Jackson turned 31 and was nine years removed from the 4.35-second 40-yard-dash he ran at the combine in 2008. However, if you ask head coach Dirk Koetter, Jackson was still frequently getting open – the issue was poor chemistry. After double-checking our grades, I’m inclined to agree. Jackson ranked 16th-best in PFF receiving grade, despite ranking 46th in fantasy points per game. 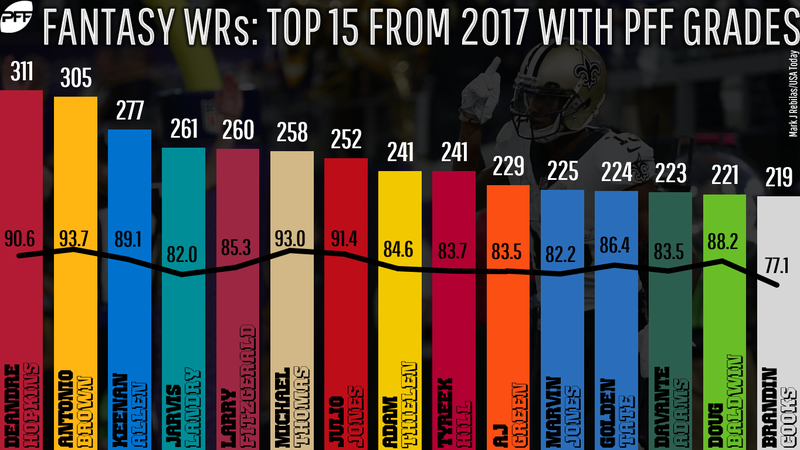 Chris Godwin (graded 27th-best) may eat into Jackson’s target total (38th in targets per game), but I’m more inclined to believe Jackson is one of the better wide receiver values in current drafts (ADP WR66). Hogan has been one of my favorite values in current drafts, especially with the injury-prone 32-year-old Julian Edelman suspended for four games. If we exclude Hogan’s Week 14 game against Miami last season, which was sandwiched in between seven inactive games, Hogan averaged 13.6 fantasy points per game for New England last season. This is only 0.1 fantasy points per game less than Brandin Cooks, who ranked 18th in fantasy points per game. Hogan would then return in time for the postseason and outscore Cooks by 3.6 fantasy points per game during these games. That being said, it’s worth noting he graded out just 75th of 117 qualifying wide receivers in PFF receiving grade last year. Hurns wasn’t very productive for fantasy last season, missing time with an ankle injury and ranking just 45th in fantasy points per game. However, he did play at a high level when on the field according to our graders, ranking 22nd in PFF receiving grade. Opportunity abounds in Dallas, with Dez Bryant, Jason Witten, and Brice Butler leaving behind 229 targets in their departures. However, there’s still a good deal of risk here as well. Hurns has scored 78 percent of his fantasy points from the slot throughout his career, which is also where Cole Beasley ran 87 percent of his routes last season. Despite the high grade, it seems likely Hurns will be playing out of position in 2018, and that’s not often a smooth transition for fantasy wide receivers (e.g. Nelson Agholor). Garcon has an ADP of WR32 despite ranking fifth in targets (61) prior to a season-ending neck injury suffered in Week 8 of last year. While his fantasy production wasn’t stellar (12.3 fantasy points per game), our graders were impressed with his performance. Garcon graded out 19th-best as a receiver last year and actually ranked even higher in 2016 (eighth-best). Factoring in the quarterback upgrade from C.J. Beathard and Brian Hoyer to Jimmy Garoppolo, Garcon is easily one of the best wide receiver values in current drafts.